“It’s that time of year again, folks,” he said every year as the glut of end-of-the-year lists start popping up on every pop-culture obsessive’s Twitter feed and Facebook timeline. But really, it is the end of the year. And that means EOTY lists are everywhere! I personally enjoy this time, being a pop-culture obsessed person. For those who have followed my writing for the past few years, I’ve always put out an EOTY Albums and Movies list, though the movies list always comes out in February of the next year (to coincide with the Oscars.) Last year, I dipped in a favorite songs list. And this year, I’m adding a best TV episodes list…wait…by golly, this is it! This is that list! How exciting! I’m taking a slightly different approach with my TV list. I love watching television, but I found it hard to get into many new shows this year given my lack of free time. I’m still a little green when it comes to excellent television, and I’ve got some catching up to do. So instead of giving you a fully fleshed out list, here were a few of my favorite television episodes of the year. After the atrocity that was Community Season 4, it was good to see Dan Harmon back at the helm of Season 5, even if we had to endure much of the season without Donald Glover and all of it without Chevy Chase. Despite these setbacks, Community remains one of the best comedies on television. I was a big fan of Advanced Dungeons and Dragons back in Season 2; it’s probably my favorite episode in the series. So I was thrilled when they returned to the concept. This time, marked by guest appearances from David Cross and Jonathan Banks (not really a guest, but whatever), the group looks to solve a professor’s relationship issues with his son by using their favorite medieval role-playing game. It highlights the shows ability to take a ridiculous premise and give it a surprising amount of heart without losing any of the madness. Game of Thrones didn’t have a moment quite as big as the Red Wedding in Season 4. Instead they opted for several more, less-shocking moments. It resulted in what was Game of Thrones’ best season to date. I was a big fan of “The Lion and the Rose”, “The Laws of Gods and Men” and “The Children” as well. But “The Mountain and the Viper” was the most visceral and gutting episode of the season. Game of Thrones works best when it’s opting for 180-degree turns in half-second intervals. “The Mountain and the Viper” had an ending to match any plot twist in the show’s run (except for the Red Wedding, of course), and you could see it coming the entire time. While watching, I knew something bad was going to happen. But that didn’t make it any less upsetting. I’ll just get this out there: Hannibal is the best show on television right now. Thank the heavens that NBC renewed it for a third season (though I wasn’t worried; it would’ve been picked up by someone else.) Season Two simmered a little more than Season One as the writers turned up the heat on Will Graham’s pursuit of the truth and Hannibal’s attempts to hide his true self. “Mizumono” was the season finale of every viewer’s nightmare, leaving 4 major characters dying on the floor (top that, Game of Thrones) as the antihero strode away untouched. It was a beautiful, gory display that wouldn’t have been possible without the brilliant cinematography of James Hawkinson, the brooding direction of David Slade or the flat out brilliance of Mads Mikkelsen. I was enthralled for the entire 44 minutes. I couldn’t look away, as much as I might have wanted to. Truthfully, I’m not the biggest fan of Parks and Rec. Sure, it’s good for a few laughs. And there’s no denying the brilliance and chemistry of the cast. But I still view it as a lesser version of The Office, except for the small distinction that it got better while The Office got worse. Ironically enough, it’s episodes like “Ann and Chris” that make me frustrated with Parks and Rec. I don’t feel nearly as connected to the characters as I did to those in The Office. But Ann Perkins and Chris Traeger were standouts on the show, two characters I felt deeply for, together and individually. Their exit was hard to watch, especially as it brought all the other characters alive. Their loss will be felt. Psych was never the critical darling that many of the shows on this list are. But it was never a show searching for accolades. The quirky, unbelievable USA comedy was always comfortable in its own skin, making it the most enjoyable television show airing for years. Consistently funny and always heartwarming, Psych‘s referential humor and incredible cast chemistry endeared the show to its fans. So while the last season wasn’t always the strongest, it didn’t feel any less enjoyable. The show went out on its own terms, and that ended up being its saving grace. I particularly enjoyed “1967: A Psych Odyssey” because of its focus on Lassie, a character that finally got some deserved development in the latter half of the shows run. It’s an episode that proved Psych was not a one dimensional show in terms of character. Instead of just being about two lovable goofballs, it’s a collection of diverse and endearing people. I know people have gripes with the latest season of Sherlock. And to that, I’d say, “Nuts to you.” The BBC’s take on the world’s most famous sleuth is consistently brilliant and darkly humorous. Attribute the strength mostly to Benedict Cumberbatch’s show-stopping talent if you will; Sherlock is consistently pushing the boundaries of creative direction. True, Season 3 wasn’t quite the knockout of Seasons 1 or 2. But that doesn’t take away from its strengths. “The Sign of Three” humanizes Sherlock in a major way coming off the heels of the Season 2 cliffhanger/Season 3 opener. He’s not just a highly-functioning sociopath; he’s a person with thoughts and fears, fears he has to face in the midst of *gasp* another murder. In terms of pure entertainment, it’s hard to look past Sleepy Hollow as one of the year’s best shows. The entire premise is ridiculous, but it’s the people and the emotions that bring this otherwordly show back to earth. A lot of this has to do with the work of the show’s two leads (and John Noble), but kudos to the writers for never losing sight of one of the show’s main goals: to shock. “Bad Blood” was one of the year’s best finales, introducing a plot twist so horrifying that I really did anticipate the next episode over the quiet 6 months it wasn’t on. And while ending on a cliff-hanger can be taken as a worn out trope, it can be nice to balance those with the utter absurdity found in Sleepy Hollow. Above, I said that Hannibal is the best show on television. 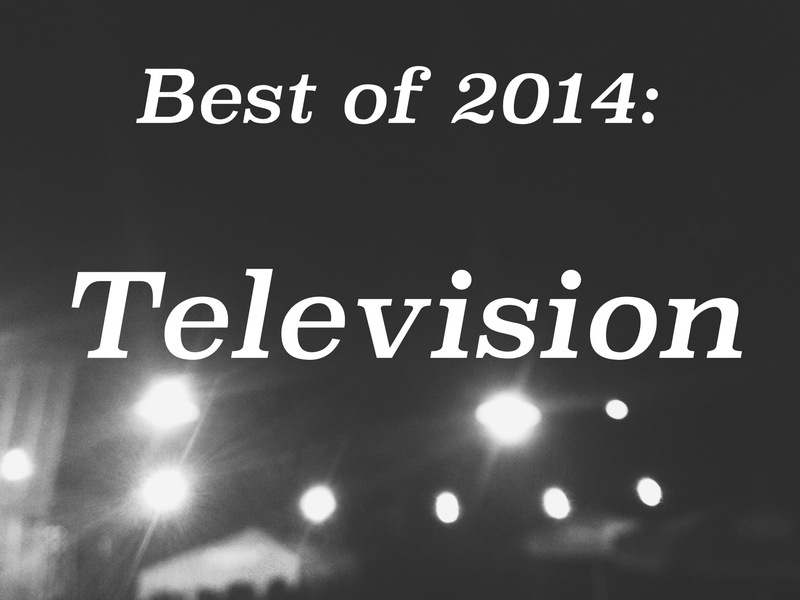 However, it wasn’t the best thing on television in 2014. That distinction belongs to True Detective HBO’s stunning, pulpy crime drama that became so much more than “whodunit?” Nic Pizzolatto’s southern Gotchic, neo-noir miniseries exposed mankind’s fascination with darkness, but it also acted as a fascinating study on morality and philosophy in the face of evil. Drawing from old 19th century horror literature and the rejuvenated career of Matthew McConaughey, True Detective only took 8 episodes to capture a nation of television consumers who found themselves not only wondering about the Yellow King, but also about the ravings of Rust Cohle, a man so utterly wild that it’s easy to lose sight of just how relatable he is. With the loss of Breaking Bad and the impending loss of Mad Men, AMC is going to have to rely on The Walking Dead as its new critical darling, the show that everyone can look at and say, “Yeah, it’s popular, but it’s also good.” After a catastrophically bad stretch of episodes (early Season 3-mid Season 4), The Walking Dead has transformed itself into one of the most consistently engaging and watchable shows on television. No longer does it have to rely on the hordes of undead to draw in viewers. The characters aren’t brooding and rotting in a jail cell anymore. They’re engaging the world around them and the people they’re with, making themselves more likable and, ultimately, harder to let go of. Of course, this all has to do with the writing. “Four Walls and a Roof” was a statement episode in what has been the show’s best season to date. This isn’t a group that sits around waiting for trouble to come to them. No, they seek out the trouble looking to eliminate it.